My three best friends from college and I still “talk” daily. And by talk I mean text. Our group messages might just be the most honest glimpse into real life that you can get without actually being there in person. We celebrate (personal accomplishments, important milestones, things our kids do, etc.). We cry out for help (prayer requests are common for everything from crises at work to sick children to days when we’re stuck in traffic with no hope of getting to wherever we’re going on time). We reminisce (my favorite thing is to randomly send them photos of us from twenty or more years ago. It takes us down memory lane and makes us pause to celebrate our lasting friendship). But it’s nice to be able to be in nearly constant contact with them. A couple of weeks ago, I had one of those “memories” pop up in Facebook that surprised me. Ten years ago, in January of 2009, I turned in my very first contracted manuscript. Time sure flies! And now, as I’ve received the rights back to most all of my early books—from 8-10 years ago, I can’t help but read them with a “2019” mindset. And it makes me think about how different some things are in the world. Just as I wasn’t Instagramming and selfie-taking my way across Europe back when I was in college, things were also pretty different a decade ago when I wrote those books! Lingo changes, pop culture changes, technology changes…but there are also a lot of things that stay the same! Relationships, a desire to walk closer to the Lord, a search to find ones place in the world—those things are common no matter the year. I’d planned on giving those old stories a little refresh, but now I think they may need a bit more of an overhaul before they get re-released out into the world. I read “dated” stories from time to time—especially when I find a new-to-me author and I want to go back and read some of his or her earlier work. And I admit that sometimes when it’s not quite old enough to be historical but definitely not new to be current, it does sometimes seem dated. I’m curious what you think—do you or have you read books that are contemporary, yet feel a little “dated?” Does it take you out of the story or do you just read on and ignore those little things? 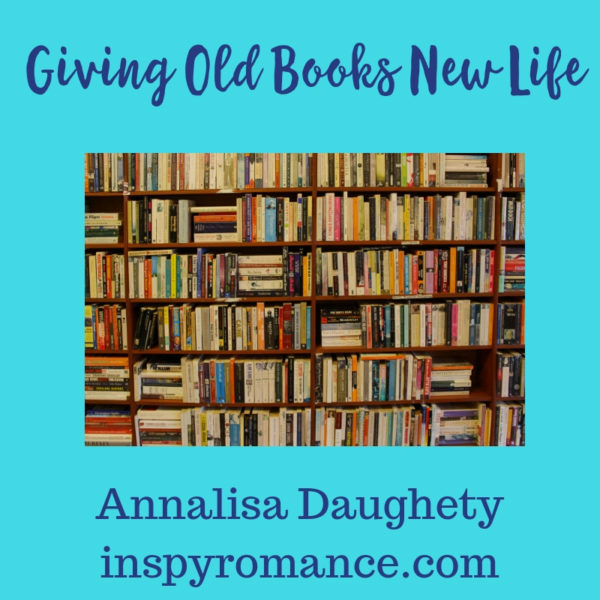 I’m hopeful that by giving my older stories a more current setting, it will help them resonate with readers who’ve either never read any of my stories or who are reading those older books for the first time. I hope your February is off to a great start! Hi Annalisa, how great that you keep in touch with your college friends:) I teach high school students who are so obsessed with their social media- their snapchat and instagram that they lose sight of the bigger picture and don’t savour where they are at. I don’t mind reading stories that are contemporary but ‘dated’- so long as it is a good story. They make me smile to see how things have changed. Good point, Wemble! It’s definitely interesting to think about how things have changed just in the last 10-20 years! Hi Annalisa! As a retiree, I do not mind reading a contemporary story that is dated. After all I lived through the times and like to remember the journey into modern times. Also younger generations need to be reminded of how life changes. I have lived in our community for 60 years. Yesterday my grandkids ages 12, 11, and 5 had a half day of school. I took them to their mom’s dentist office for their dental appointments. As we crossed the river, I told them I remember when the 4 lane bridge was built. Or how I never took a bus to school and in elementary school went home for lunch. That in 4th grade I crossed the busy street we were driving on to walk home to eat lunch. My 11 year old grandson wanted to know how I remember everything. I said we had few distractions. NO TV, tablets, cell phones. So yes, maybe stories should not always be updated – as readers we needed to be reminded of our journey. In Europe one can still worship in cathedrals from the 1500s. As a reader, a Note from the Author stating how the book evolved or why one may notice some “dated” items is appreciated. Best wishes and enjoy your weekend. Very true! Last weekend, we took our 13 year old on her first flight—when we were waiting at the airport, I explained to her how that even when I was in college taking my first plane trip, it was totally different and my family could go with me to the gate at see me off, and be there waiting to pick me up as I stepped off the plane. Definitely a big difference now! And an author note is a great idea. You still can in Australia on domestic flights. you do get screened but you can go to the gate. I do not have any issues with “dated” contemporary stories! Of course, I am of an age where my first collection of music was on 8 tracks, lol! :) I remember 8 tracks! Old friendships are the best, aren’t they? As for “dated material,” I have three television shows that I re-watch from time to time – Remington Steele, Scarecrow and Mrs. King, and Sue Thomas:FBEye. To me, the stories never get old, and the dated facts simply make me grin. I understand, though. Now I have to worry about how to write text messages and describe the various “dings” on a cell phone! LOL! I’m just happy you’re re-releasing your books, even if it takes a little longer to do so! Regina, they sure are! We watch Andy Griffith and I still love Whos’s The Boss and Growing Pains. I’ll rewatch any chance I get. :) And Thanks—I am ready for those older books to be back out into the world! I guess I’m dated because I still have a home phone and answering machine. I have read books that feel dated and those things do take me out of the story and lessen my overall enjoyment of the book a bit. That being said, for me it does sometimes depend on what elements feel “old” and how important they are in the story. I read more Historical than contemporary but for someone like me who only got a mobile phone in the past 10 years and only got a smart phone last year and still mainly use it for texts in emergency or when away those things don’t worry me as much. Also my landline now has a way to for people to leave a message and that’s only in the past 2 years. But I could see how some things can be interesting. The things I guess I look at is when the book was published. I have lots of unread books which I know will have some things that are out dated but its not a huge thing for me. However if the book was published today and was out of date then it would be strange. I still love your early books especially the set about National Parks. Great points! And I’m glad you enjoyed the National Park series! That is one set I plan to re-release. As a curious reader, I like to know what’s being referenced. If I understand a dated technology reference, it might make me smile with nostalgia. If I don’t understand it, I may go look it up, which would be a distraction from the story. I’m in favor for “dated” books – they hold history. It’s so special that you keep in touch with your college friends. Until last summer, I’d lost touch with my college besties. Then one of the girls initiated a get-together. We all met up in Nashville (4 had to fly in from around the country) and rented a house for a few days. It was absolutely the highlight of my summer. We now have a text group thread where we share our daily stuff. It’s been great, and I’m determined to stay in touch!